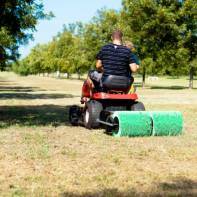 Imagine gathering your nut harvest by simply riding your mower, golf cart or ATV. That's what you can have with the 36" Pull-Behind Nut Picker Upper made by Bag-A-Nut! We are excited to add this product line to our offerings this season because we believe in the effectiveness of this product! Three times the length our of standard customer favorite, the 36" Pull-Behind Nut Roller has double baskets for less stopping and emptying. Easy to use, great results! Watch how the 36" Pull-Behind Nut Roller works. Size small for 1 1/2"-2" black walnuts. Size medium for 2 1/4" to 3" black walnuts. Size large for 3 1/4" to 4" black walnuts.